Prof. Atay Atabey is an experienced surgeon, who is performing surgeries in Izmir. He undertakes all aspects of aesthetic and cosmetic surgery. Dr Atay Atabey is a Professor of Plastic and Reconstructive Surgery. He has completed his undergraduate education at the Cerrahpasa Medical School and then completed his residency in Plastic and Reconstructive Surgery. After residency, Prof. Atay completed his post-graduate fellowship at the Dokuz Eylul University in 1990. He had been working as attending surgeon and lecturer in Dokuz Eylul University from 1990. Between 1998 and 2000, Prof. Atay Atabey has worked in `John Hopkins University, School of Medicine` as a Postdoctoral Fellow. After his return to Turkey, he took part in lecturing again along with performing cosmetic surgeries. For his work on the academy, he won many prestigious prizes and published many articles in world famous journals. 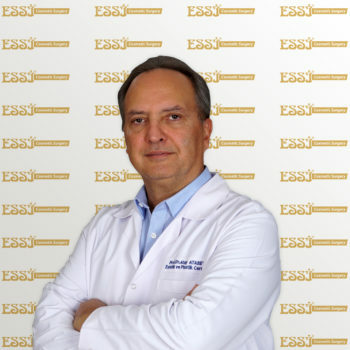 From 2004 to 2010, he acted as the Head of the Department of Plastic, Reconstructive and Aesthetic Surgery in Dokuz Eylul University Medical School. Prof. Dr Atay Atabey is recognized nationally and internationally for his clinical work and research in aesthetic and cosmetic surgical outcomes and surgical education. He has been involved in thousands of aesthetic operations in his career. He specializes in all aspects of cosmetic surgery area including body procedures, breast surgeries and facial reformation surgeries. He performs his surgeries in Izmir and he is fluent in English.